Looks like the honeymoon might be over between U.S. President Donald Trump and Vice President Mike Pence. 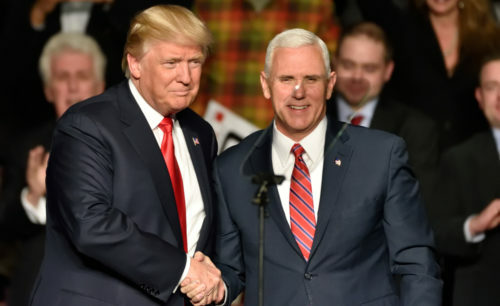 The New York Times reports that Trump has asking aides and advisers whether Pence is loyal to him, a sign that he has grown irritated with the Veep. Apparently he has asked the question so many times that it’s beginning to alarm White House aides. NYT reporters Maggie Haberman and Katie Rogers say that Trump’s advisors have reassured Trump that Pence has been “a committed soldier,” often traveling to meetings and parts of the world that Trump wants to avoid. But others have told Trump that his religiously conservative VP is no longer useful now that Trump has forged his own close relationship with his evangelical Christian supporters. In 2016, 81% of white evangelical voters voted for Trump. Trump has since pleased them by rolling back LGBTQ rights in the name of “religious freedom” and defending the tax-exempt statuses of churches that get involved in politics. The NYT reports that Trump has long distrusted Pence ever since his 2016 response to Trump’s 2005 Access Hollywood comments admitting his sexual assault of women. Trump’s anti-Pence advisors have suggested Trump find a 2020 running mate who could help him gain more female voters. An estimated 47% of white women voted for Trump in 2016 (compared to only 25% of Latinx women and 4% of black women). While some advisors have floated Nikki R. Haley, the former U.S. ambassador to the United Nations, as a possible 2020 running mate, political commentators told the NYT that presidential incumbents often consider changing their running mates before re-elections, but few (if any) ever do.